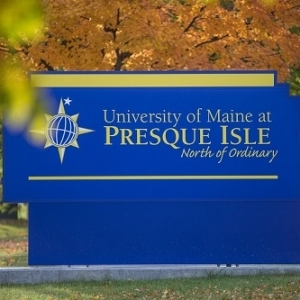 Whether it’s helping athletic fans to better enjoy the game or providing convenience for students in need of a battery boost for their mobile devices, University Credit Union is continuing its tradition of collaboration with the University of Maine at Presque Isle in several ways this academic year. With UCU’s support, the University was able to install a brand new scoreboard in Wieden Gymnasium this basketball season. The LED scoreboard features “intelligent captions,” which allow team names to appear on the board, as well as panels for the home and visiting teams that let fans keep track of individual players’ points and fouls. Still to come are improvements that will be made to the Athletics locker rooms in Wieden Hall, as well as a mobile device charging kiosk, slated to be installed in the Owl’s Nest, on the first floor of the Campus Center. Just last year, significant support from UCU allowed for the installation of two new entryway signs on campus—at the south entrance and at the entrance at Preble Hall—as well as an update to the lighted marquee at the north entrance to campus to ensure the three signs incorporated the same design. 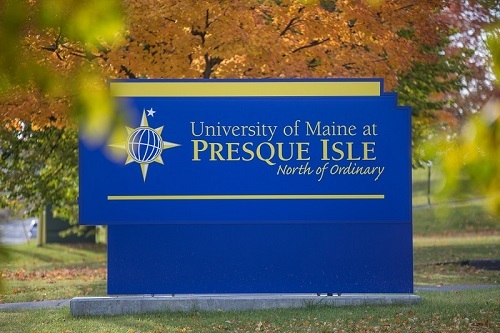 These signs, in UMPI blue and gold, showcase the University’s logo and are lighted, so they can be seen day or night. Prior to this, UCU support allowed for a major way-finding signage update to campus—large signs were installed outside each campus building, listing the major services provided inside, and three campus map directories were placed at strategic points on campus to provide easy reference for visitors or individuals looking for a particular campus office or service. In addition, UCU officials work with the University’s Student Financial Services officers on a continuing basis to help provide financial literacy educational opportunities to UMPI students. For example, UMPI and UCU team up on SALT activities—SALT is a program created by American Student Assistance that helps students become more financially savvy and better manage their money and student loans. The team was nationally recognized in 2015 for its creative “SALT Cash Cab” event, a game where students can earn candy and a little pocket money by answering questions about the SALT program. The team works continually to ensure that students on campus know about the free resources available to them through the SALT program. UCU opened its UMPI campus branch in 2010, although the credit union had a long-standing history of serving the campus employees, students and alumni and their families. The branch is home to UCU Campus Branch Manager Jessica Ouellette and features an Interactive Teller Machine that allows members to access a live UCU teller by video chat, allowing for all of the transactions to take place that traditionally are performed over a teller line. Providing these branch services on campus allows UCU to serve the UMPI and greater Presque Isle community with state-of-the-art technology and personalized service.